The medical diagnosis of malaria can be made simply by considering the patient’s medical history, any malaria-related symptoms that are exhibited, and clinical findings. But the presence of malaria must always be confirmed by a laboratory diagnosis, which involves the detection of the malarial parasite or its antigens in the patient’s blood. The Rapid Diagnosis Test is a commonly conducted test for the diagnosis of malaria. Here is a brief look at the different tests involved in the diagnosis of malaria. Microscopic examination is a simple confirmatory test that’s recognized by a majority of laboratory technicians. 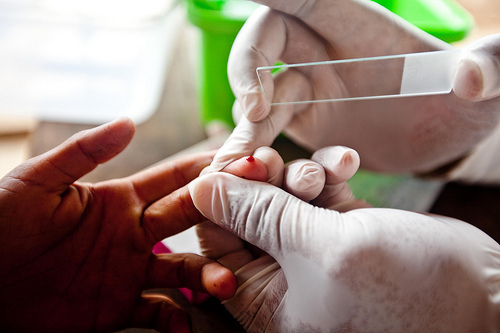 If you are getting tested for malaria, a drop of your blood will be taken by pricking your fingertip. It is then spread on a glass slide to form a thick peripheral blood smear. This is then dipped in Giemsa stain, a reagent which stains the causative parasites of malaria, and visualized under a microscope at a magnification of 1000 times. The malarial parasites can be easily identified by their physical characteristics and by the structure of the red blood cells that they have contaminated. To arrive at an appropriate diagnosis, the doctor does not rely on a single image, but observes at least 100 microscopic fields as part of the morphological variety diagnosis of malaria. In this test, parasite DNA is identified using polymerase chain reaction or PCR. This is the most precise test currently available, and unlike other methods, can recognize low levels of malarial infection. But it is also an expensive test. While these tests help in the identification of antibodies against malarial parasites, they are not useful in detecting an existing malarial infection. The Rapid Diagnostic Test ( RDT) has been developed in various forms such as dipstick, card, pad, strip, and cassette, and it’s quite safe. In this test, a 2 to 50µL blood specimen is usually collected by pricking the finger. The blood specimen is mixed with a buffer solution that contains a compound capable of destroying the red blood cells, and a precise antibody that is marked with a marker that can be easily visualized, like colloidal gold. This form of an immunochromatographic test helps in the detection of the antigens in 2-15 minutes. It is indeed a useful alternative to microscopic examination, in circumstances where dependable microscopic diagnosis is not accessible. But you should ensure that following all negative RDTs, a microscopic examination should be performed for the confirmation of the result. Similarly, microscopy should be carried out following all positive RDTs as well. The latest approved RDT helps in the detection of 2 different malaria antigens, out of which one precisely targets the Plasmodium Falciparum parasite and the other responds to all the 4 species of malarial parasites that infect humans. You should understand that microscopic examination is a routine diagnostic test, but PCR and serology require specialized laboratories. Immunochromatographic investigations that detect the malaria antigens have been developed in the last decade and they have marked a breakthrough in the diagnosis of malaria. Once the condition is diagnosed, you can quickly look into the different malaria treatment measures available. This entry was posted in Malaria and tagged laboratory diagnosis of malaria, malaria diagnosis by Zipheal Editorial Staff. Bookmark the permalink.